Madrid, the cosmopolitan capital of Spain, is one of the most breathtaking cities in Europe. With its intense cultural activities and artistic vitality, it is a favorite among visitors and loved by its own community. This nocturnal city is famous for its nightlife, scrumptious food and festivals; it also provides numerous choices of bars and clubs where anyone could drink and enjoy. Madrid is an energetic city with a diverse range of activities such as visiting the well-known bullfights, watching Spain's most prominent soccer team Real Madrid, bargain shopping or experiencing Flamenco, you will definitely find your Spanish adventure an unforgettable one. The majority of Madrid's major attractions are within the heart of the city allowing much to be packed into a short stay. The Ritz Madrid is a luxury palace hotel located in enviable surroundings, close to the Prado and the Thyssen Museum in the heart of Madrid. Built in 1910 according to the wishes of King Alfonso XIII, The Hotel Ritz transformed Madrid from a small provincial town into one of the truly great European cities, able to receive visiting aristocracy and dignitaries in exquisite style and luxury. 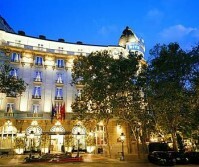 Hotel Ritz Madrid has long provided the Spanish capital's most elegant entertainment, hotel accommodation and service. To stay at the Hotel Ritz is to step inside a baroque palace with individually designed rooms, superb cuisine and impeccable service; it remains faithful to those standards of excellence that have placed it among the worlds' premier hotels. It is one of the most stylish restaurants in Madrid , attracting occasionally the Spanish king. The restaurant's décor is a nautically inspired mass of hardwood panels, brass trim, old-fashioned pulleys and ropes, a tile floor custom-painted sea green and blue waves. Menu choices include paprika-laden peppers stuffed with fish, Cantabrian fish soup, salmon in cherry sauce, and loin of veal in cassis sauce. Desserts include such selections as a rice mousse with pine nut sauce. 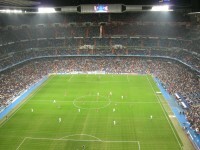 We will visit one of largest football stadiums in Europe  the home of the prestigious Real Madrid Football Club. On 14 December 1947, after the match between Real Madrid and the Portuguese Club Os Belenenses, the Santiago Bernabéu Stadium was inaugurated, considered to be the best and most modern one at the time. Since then it has been renovated several times to keep it up to most modern standards. Guests will initially enter one of the spectacular eight panoramic elevators that were installed in the Stadium in summer 2002. Arriving at the top you will have an amazing panoramic view over the stadium. The visit will lead you through the stadium to see the VIPs box, the press room and a perfect replica of the player's cloakrooms, which are among the most modern ones. The guests will have access to the field through the players' tunnel. The Stadium also offers a museum with all the Trophies the Club has won in its successful history. The group will have the possibility to shoot some penalties on the playing field. 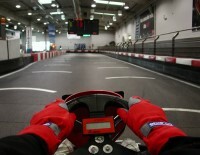 The Carlos Sainz Indoor Karting Complex is the ideal venue to hold an interactive, sporty and different business event. Climatised, covered, 450 m2 racing circuit equipped with the most innovative technologies and security features perfect for team-buildings and friendly competitive events. Each participant receives a competition jumpsuit and helmet Race track. Crew keep track of the races all the times and direct them via a system of lights and flags. Each kart is equipped with a security bar and belt and are connected to the central computer for turns, race times and classifications. What can you do at night in Madrid that you cannot do in any other European capital? Experience Flamenco. When you are done with sightseeing and the museums, when you have exhausted all the shopping possibilities and when you have gained a nodding acquaintance with the innumerable tapas bars and restaurants and the entertainment on offer, you still haven't experienced Flamenco! Flamenco is an exquisite and fascinating art which identifies itself in an admirable way with the philosophy of life and the dignity of the Andalucian people. One of the best Flamenco nightclubs in Madrid , Corral de la Moreria offers great ambiance, good food, and a splendid Flamenco Show. They are well known as being the step to fame' in the world of flamenco dancing. Top performers in Spain began their careers at Corral de la Moreria. Located 88 km from Madrid, Segovia could be described as a beautiful symphony of light and shape, set against the splendid background of the blue-tinted snow-capped peaks of the Guadarrama mountains. The town itself lies perched between two deep valleys formed by the rivers Eresma and Clamores. The Aqueduct, the Alcázar and the Cathedral are the most characteristic monuments of the city. 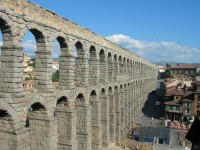 One of the greatest surviving monuments of Roman engineering, this aqueduct stretches from the walls of the old town to the edges of Sierra de Guadarrama. It is about 2950 feet long although the section where the arches are divided in two levels is about 900 feet. It is made of rough-hewn massive granite blocks, joined without mortar or clamps. This old Castillian inn can be found under the stones of the Roman Aqueduct. The ancient hostel, founded in the 1760's has remained nearly intact. Exquisite Castillian meals are served. The Mesón Candido is internationally recognized historically, artistically and gastronomically. The Mesón de la Guitarra is loud and exciting on any night of the week, and it's as warmly earthy as anything you'll find in Madrid . The decor combines terra-cotta floors, antique brick walls, hundreds of sangria pitchers clustered above the bar, murals of gluttons, old rifles, and faded bullfighting posters. Like most things in Madrid , the place doesn't get rolling until around 10:30pm , although we will drop in for drinks and tapas. A huge game between two huge teams. Real Madrid and Valencia, two sides that know what it is like to finish the season as champions.